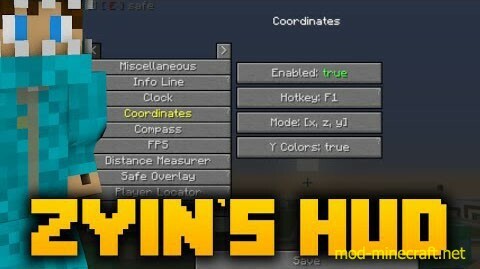 Zyin’s HUD Mod is a mod which adds various utilities and enhancements to make your life easier. Designed with the advanced Minecrafter in mind. 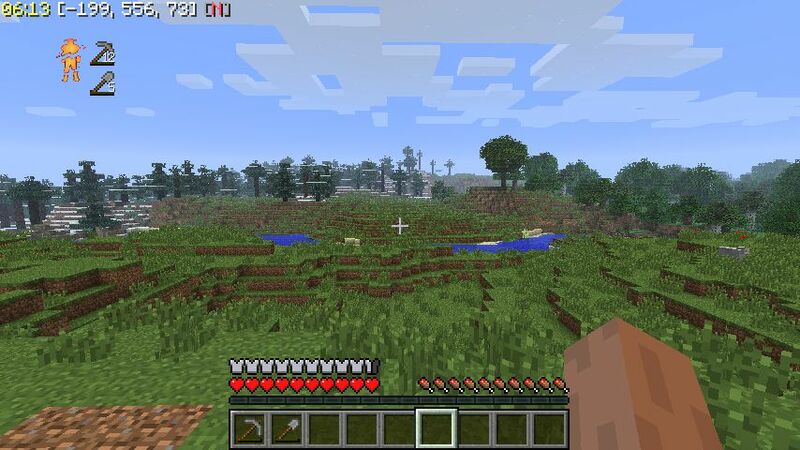 It adds your coordinates, a compass, a clock, calculates distances, shows nearby players, shows unsafe areas, shows potion durations, quick deposit, eating aid, ender pearl aid, potion aid, torch aid, weapon swapper, an fps counter, displays animal info, item selector, health monitor, and dynamically displays your equipment’s durability. Any one of these features can be disabled. It works in both single player and multiplayer servers. The options menu can be access through the pause menu, by pressing Ctrl + Alt + Z, or typing ?/zyinhud? in single player. You can change almost anything about any feature to your hearts content. The Miscellaneous section has functionality not relating to anything in particular. Improves the default middle click (select block) functionality by selecting the mouseovered block if it exists in your inventory instead of just on your hotbar. Shows a clock that can show standard time or a countdown till the end of the day/night. Coordinates show your (x, z, y) coordinates along with what direction you’re facing. The y coordinate changes color based on what ores spawn at that elevation. You can also press F1 to input your coordinates into chat while typing. Animal Info (hotkey = O) will display the stats of any horse, even untamed and baby horses, as well as breeding information for breed-able mobs. You can show the horse stats with an on screen overlay or on the F3 menu when mounted on a horse. Safe Overlay (hotkey = L) shows unsafe areas where mobs can spawn. Hold down the plus/minus key and then press L to increase/decrease the safe checking area. Hold 0 and press L to reset distance back to default. 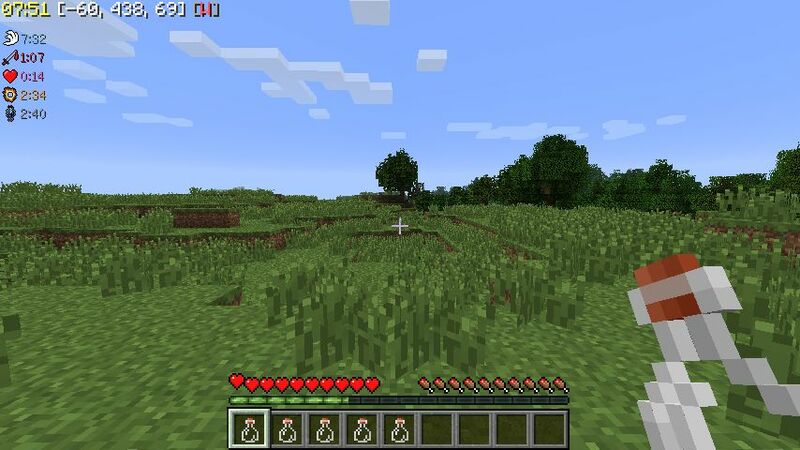 It is extremely accurate in determining where mobs can spawn and is multi-threaded for increased performance. 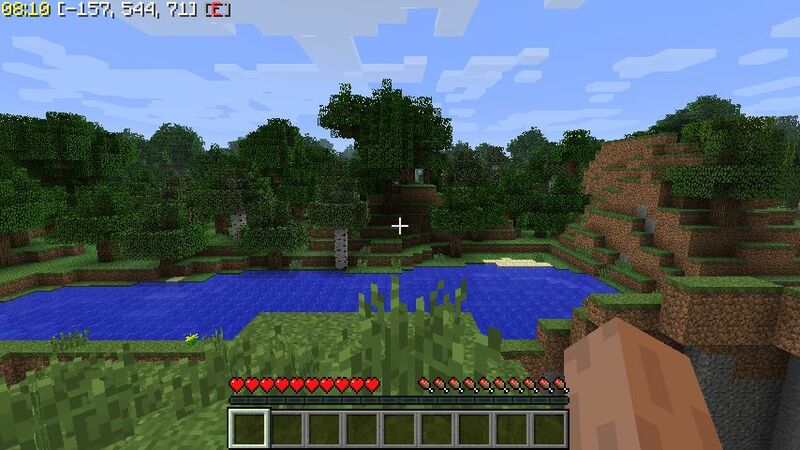 Big shoutout to Zombe’s ModPack and LLOverlay for their open source code which helped in developing this. Durability Info provides a customizable display that shows you which pieces of your equipment are breaking. 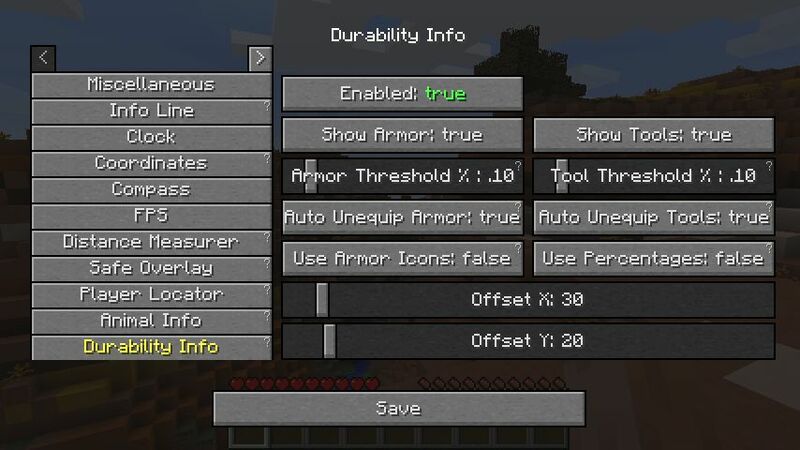 It works with tools on your hotbar and armor you have equipped, and can even auto-unequip them before they break. Player Locator (hotkey = P) will show you where nearby players are. It can also tell you how far away they are and their health. Never again will you be caving with a friend and ask which way he went. Potion Timers will display the remaining time on your potions whenever you drink a one (look in the top left). Weapon Swapper lets you press F to quickly select either your sword or bow. Press it again to switch between the two. Eating Aid lets you press G to quickly eat food, even if it’s not in your hotbar. Also works with the PvP Soup server plugin. Ender Pearl Aid lets you press C to quickly throw an ender pearl, even if it’s not in your hotbar. Potion Aid lets you press V to quickly drink potions, even if they’re not in your hotbar. It intelligently determines which potion you need based on your condition. For example, if you’re burning in lava it’ll use a fire resistance potion. If you’re injured, it’ll use a health or regeneration potion. If you’re ok it’ll buff you with swiftness potions, strength potions, and invisibility potions. Torch Aid lets you place torches when you have a pickaxe, axe, shovel, or nothing in your hand by right clicking. It even works when you have torches but they aren’t on your hotbar. 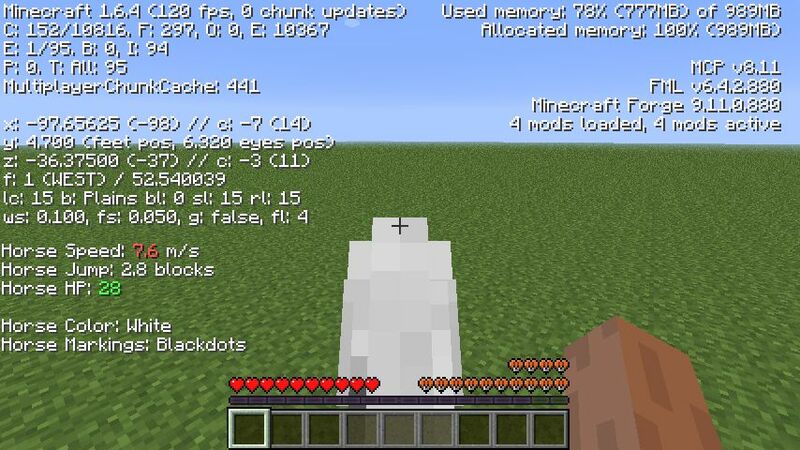 Displays a simple FPS counter. It is turned off by default, but you can turn it on in the config file. In single player you can type ?/fps? to toggle it on/off. Distance calculator (hotkey = K). 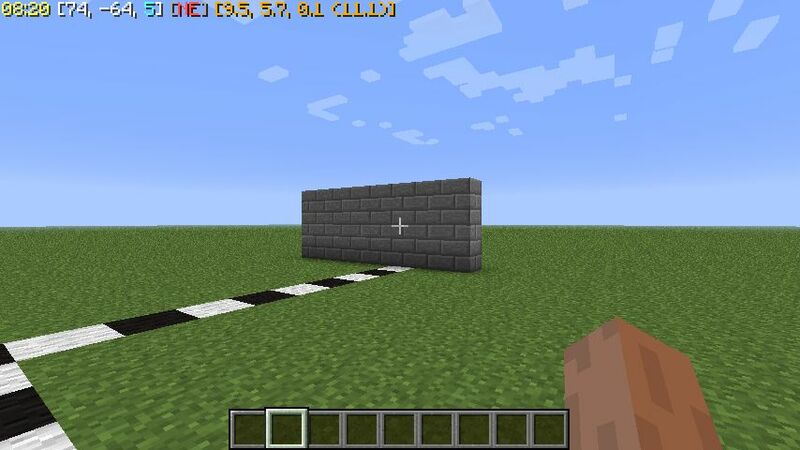 Useful for building and measuring distances from your crosshair. 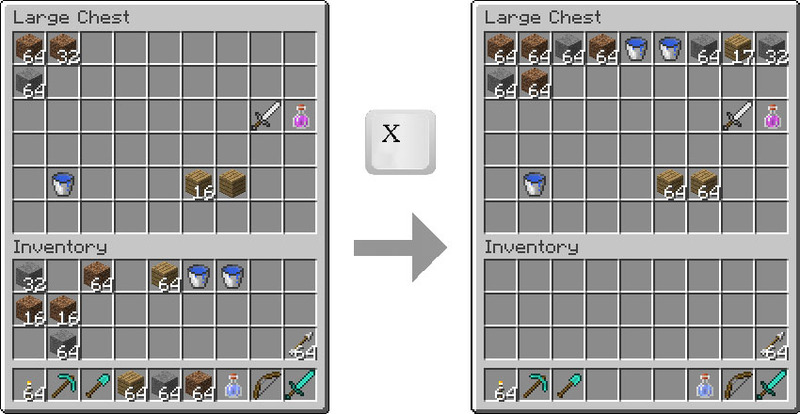 Quick Deposit (hotkey = X) allows you to easily deposit items into your chests. It is very similar to Terraria’s quick stack functionality in that it will detect what items in the chest and deposit those items from your inventory into the chest. In addition to chests, it also works with villager trading windows, furnaces, brewing stands, hoppers, droppers, dispensers, and horse inventories. The Item Selector helps you quickly select items from your inventory without having to open it. While holding down the left Alt button, use your mouse wheel to scroll through items that are inside of your inventory so they can be placed onto your hotbar. Remember the old Zelda games and their annoying warning beeps when you’re about to die? Health Monitor gives you that same annoying sound from Ocarina of Time, Link to the Past, Oracle of Ages/Seasons, Links Adventure, Legend of Zelda, or Adventures of Link. But don’t worry, it’s disabled by default so you don’t have to be annoyed by it unless you enable it.